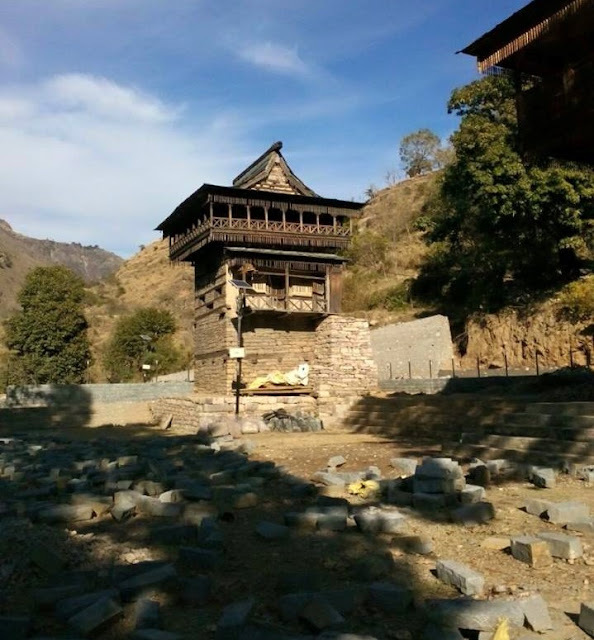 kingdom Pandwas the son of Kunti And Pandu had gone for the exile in himalyas as they reach at a lot of destinations across India and Himachal Pradesh. They came here and live at a place and made a hut of wood and shrubs etc. At the place and in this hut they live and they establish MahaShiv Linga of Devon Ke Dev Mahadev at this place on their halfway to spent the night there on their journey to the Himalayaas. They established this Maha Shiv Linga their and from this event that Place was known as Pandowas, now the modern days it is known as Pandoa (nears about 25 kilometers from Suni and Near about 75 kilometers from the Shimla, the capital of Himachal Pradesh in the bank of Satluj on the way to Rampur). Then in the old time when in the old days the Maha Shiv Linga was founded there the people of there started worshiping their and the deity is known as Shri Pandoi devta. Pandoa is the mool Sthan (Place) of Mahakaleshwar Pandoi Devta Ji. It is believed that in Pandoa they found the most important deity when the started to search the ground people found there a Gaja the main power of Deiwokar and a Murti of Deiwkar ( the main and spiritual power of Devta sahib. It is believed that the Murti of Deiwkar found there has some supernatural powers and that Murti was found there can fly himself in the air and reach at the persons house where that devotee at that exact place where he want their god to sit with purity) but this original murti disappeared these days and there is now the new one.The Gaja at this particular time present at the place of Shree Deiwokar at Sandoa village. 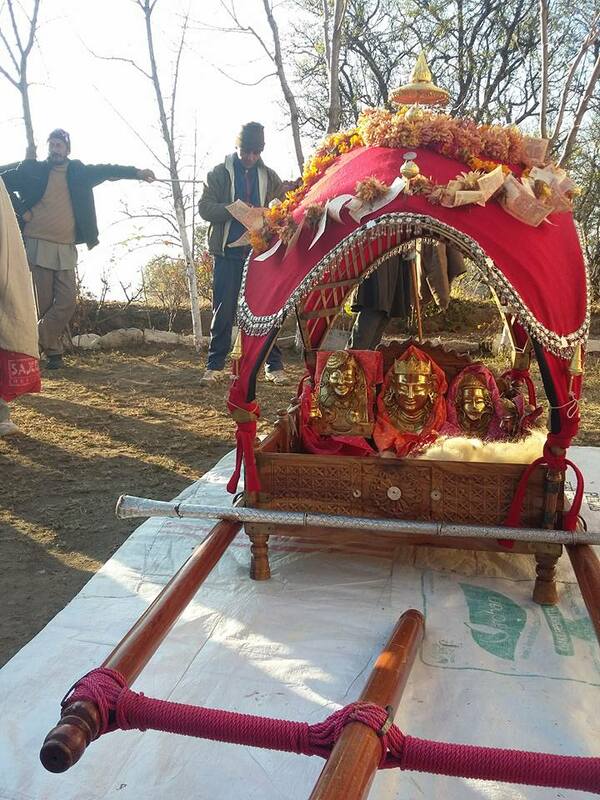 In the Palki of Devta Sahib there are five deties sitting on the cart. The Mool, Deiwokar, Sadrail, Sheer and Bazeer. Mool or Bada Devta's origion can't exactly be traced but believed that when they are being carried to Pandoa they have been stolen at the place Mool Bhajji place nears Choutha pargna at Suni-Theog border. To Mool Bhajji it was the main entrance of Suni Riyasat from old times also it was the main capital of Rajas before they shifted to Sunni. According to Legend When Mool devta was carried from mool bhajji they are known as Mool. At the time when they are taken by the reserved persons or thakurs. a voice was listen by them the voice of unknown was saying padoon padoon and the Thakur says Pad and the mountain above them was fall in front of them and another deity fell out from this mountain and that was Bazeer which was taken along with the Mool. The place where Bazeer was founded was near about Kumarsain theog border. Sheer was founded in Kothi village when some villagers were digging the fields with Kudal suddenly Kudal struck the Sheer statue and a sign was formed on the statue. Pandoi Devta known as the King of Teen Mulkh. This area of teen mulkh (Kunotal, Bhajji, Chekla, Chabishi and Moolbajji, Bashqad) (has almost of the main Bhajji(Suni) Saraj area and almost of Chekla (Kumarsain) and some of Theog villages. Kuntal (the four main villages of The Kandaans of Devta Pandoi (villages are Damog, Natrar, Sandoa , Aeog). Pandoi devta has a beautiful cart of wooden base and upper part of the cart is made of the bamboos in which a red colours shining cloth is covered in that carrier of Red shining Silk cloth named as BANAATH which covered by beautifully made JHALLERS made of gold and covered by mostly gold and silver. The Rath or Palki carried by four people in which 5 Deities naming as Mool ( Bada dev), Deiwkar (sitting on chair, also known as Dudha Dhari), Sheer, Sadrail and Bazeer were placed along with some beautiful decorations covering with golds screws like pandets named as KALASH at the Top of that Cart of Bamboo is known as CHATTAR. The cart carry five deities in the cart or Rath so it is known Paanch Palkhi. 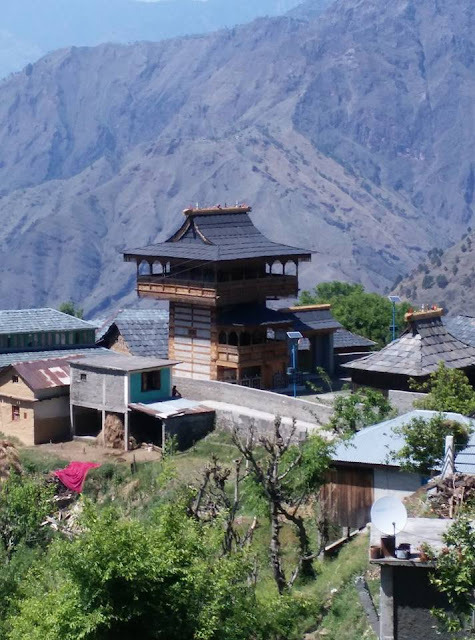 Mool or Mul Pandoi, who has temples at several villages in the states of Bhajji, Shangri and Kumharsain of Shimla hills appeared from a cave called Chunjar Malana near Mathiana 1500 years ago. About that time prince named Dewa Singh had come from Sirmour, as he had quarreled with his brothers, and accompanied by a few of his Kardars or officials and took refuge in that cave. He also had with him his family god, now called Narolia. While he was dwelling in the cave, Padoi, who was also called Mul, used to play musical instruments and then cry out, Chutun, Parun. ‘I shall fall, I shall fall’. One day the prince replied that if god wished to fall, he could do so. The image called Mul fell down before him and wished him to accept a kingdom, but he said that he was a vagrant prince who had no country to rule over. Thereupon a Bari (Mason) from Koti in Kandru pargana told the prince that he had led him to that cave, and he sought him to follow him to a State which had no chief. The mason returned to Kandru and brought back with him the leading men of that track and they led the prince to Koti and built a temple and palace that had 18 gates and occupied more than 4 acres of land. Its remains are still to be seen near the temple. Some say that the Raja placed the deota Narolia along with Mul Padoi in the temple, which stood in the middle of the palace. The deota Narolia never comes out in public except to appear before the Rana of Kumharsain, if he visit him, or before the descendants of the mason who led the prince to that country. The deota never comes out beyond the Koti basa (dwelling house)except to accept his dues (Kharen), which consist of a small quantity of grain. A few generations later it befell that a Thakur of Koti had four son who quarreled about the partition of the State. One son established him self first in Kulu and then at kangal (now in Shangri) : the second went to Tharu in Bhajji State, and the third settle at Malag, now in Bhajji, while the Tikka or eldest, as was his right lived at Koti. It is said that Raja Man Singh of Kulu took Kangal fort and also overran Koti, but others soy that Kumharsain took it. Koti appears, however, to have been reconstituted as a State soon after the disruption of Rajana, and the latter State is only remembered in connection with Mul deota’s story and the songs (bars) sung in this honour in Bhajji. Mul has five minister Shir, Sedrel ,Thathlu Rirku and Shanglu. Wherever there is a temple to Mul he is now generally called Pandoi. His principal temple is at Pandoa in Bhajji, on the east bank of the Sutlej, but Koti is his Jethu Sthan or senior place. Rirku was a Deota at Pandoa who in the spirit came flying to Mul at Koti, He ate a loaf given to him by Mul and accepted him as his master. He now drives away bhut-pret as commanded by Mul. The same is told about Shanglu. 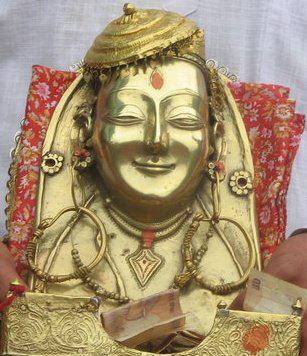 Thathlu deota is the wazir to the Mul of Koti, and when a rupee is presented to him 4 annas are given to Thathlu. 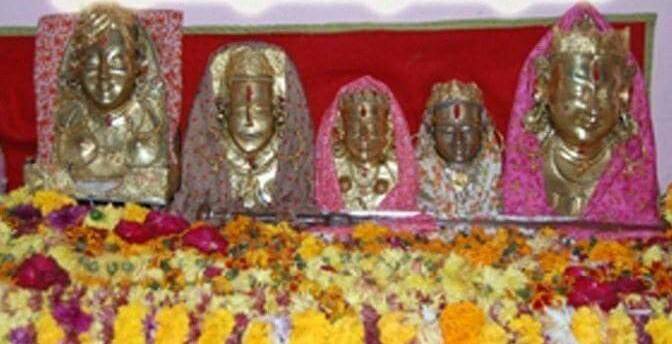 Thathlu’s temple is at Thathla in Kumharsain and in it his image is kept, but people believe that Thathlu is always with Mul, his elder spirit, and only come back to his own temple when invoked or to take dhup dip. Thathlu calls Mul his dadu (elder). Mul goes to Suni every year at the Dussahra and his spirit, also goes to Shuli to bathe. Padoa and Dharogra in Bhajji have large temples to Mul, and there is a big temple at Parol in Shangri also. Mul padoi is very useful if his help is asked in hunting and shooting. There are also two temples to Pandoi in Chebishi Pargana at Shaila and Gheti. When the Thakur of Koti fled or died his fort was burned by the Raja of Kulu, and his descendants came to Kumharsain. This happened in the time of Rana Ram Singh, who gave them Gheti village in Jagir. The Koti fort was taken by them and they held it for about 20 generations. They had brought with them to Gheti Silver and Copper images of Mul, and these are kept in the Gheti temple to this day. Other descendants of the Thakur settled in village Kariot. The Gheti people too were carrying their family god to Kariot, but on the road they came to Shaila. Nag deota used to be the god of the Shaila people, but a leper in that village laid himself on the path and begged Padoi to cure him. Padoi said that if he cures him, he must disown the Nag deota who was living in the Shailla. The leper promised to do so and was cured. The people thus convinced of Padoi’s superiority over the Nag sent the latter off to Dhalli village. Where the people still worship him, but his temple at Shaila was taken over by Padoi and he lives there to this day. Only a couple of years back devotee of Pandoi went to Theog and there built him a temple. It is said that with the prince from Sirmur came a Brahmen, a Kanet named Gasaon and a Turi (musician) whose descendants are to be found in Kumharsain, Bhajji and Shangri. The survived/ living members of this family / legend are still in Gheti and Kariot. Gheti members being the elder one are considered to be the the real descendants of Padoi’s gaddi . Presently miyan of Gheti are the khandan of deota and exhibits some rare traditions associated with Deota which are not followed any where else.